Bike Freight Transport or its staff will not be held liable for damage of whatever kind to vehicles whilst in transit. Should a claim for damages be brought against Bike Freight Transport or its staff, through a court of law, “onus probandi” will apply. To wit, the claimant must prove his claim for damages in accordance with South African Law. Bike Freight Transport operates on a payment in full in advance basis. Vehicles will not be collected without proof of payment. We are a VAT registered company and vat is applicable to all payments. 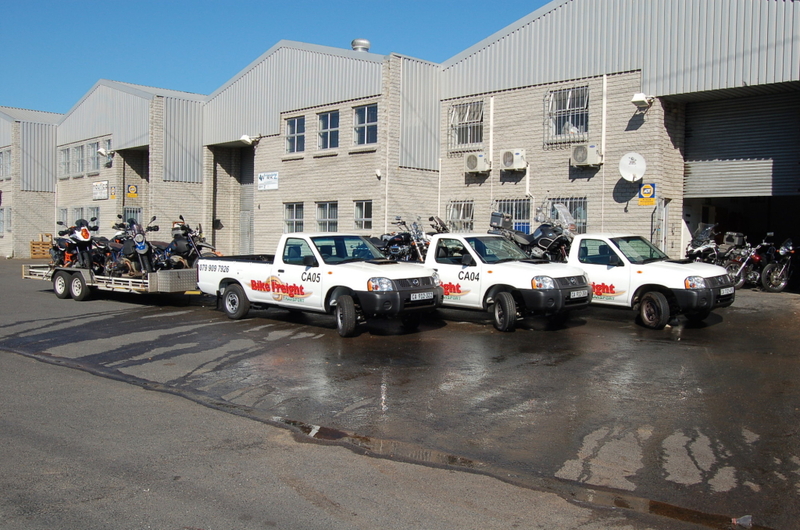 Bike Freight Transport is based in Cape Town and schedules a round trip from Cape Town to Durban and Johannesburg then back to Durban and back to Cape Town on a round trip basis. It is impossible to adhere to specific timing, therefore clients need to be cognizant of this fact and make the necessary arrangement for collection and or delivery of a vehicle in the most flexible way possible. We do offer an exclusive personal delivery service which will be quoted on if requested. Dealers especially must make provision for after-hours delivery and/or collection when it is required. Bike Transport. Terms. Delays will incur a R175 per hour waiting fee, up to three hours. Any time delay after this will be deemed a futile trip and charged accordingly. Bike Freight Transport will charge R175 per hour waiting time up to a max of three hours, thereafter the delay will be charged as a futile trip. Cancellations at site will incur the loss of the full payment paid as a cancellation fee. If we have made the effort to collect and or deliver your vehicle we are to be reimbursed for the costs incurred as well as loss of income. Cancellations received after the last working day of the week prior to and up to the day before collection or delivery was to be effected will incur the loss of 50% of the payment made in respect of motorcycle transport. Cancellations recieved after payment has been recieved and a booking has been made and accepted by Bike Freight Transport, up to the last working day prior to the week of the scheduled transport trip will incure the loss of R500 as cancellation fee. Bike Freight Transport strongly advises clients to arrange adequate fully comprehensive insurance over their asset. If the motorcycle is being handed over to Bike Freight Transport by a third party a letter to this effect must be provided to Bike Freight Transport to ensure that the handing over of the motorcycle is legally collected. If for one reason or another Bike Freight Transport is not able to collect a motorcycle as per the arrangements the client will be liable for the full fee as quoted by Bike Freight Transport. Bike Freight Transport never takes over ownership of a motorcycle, the motorcycle remains the property of the owner while being transported by Bike Freight Transport. Bike Freight Transport retains ownership of all tie down straps, material and stickers. Happens. Will happily use you again Peter. Thanks for great service and the regular updates. We have used Peter Baker since the start of this season (01.09.11). He has so far completed 4 jobs for us and we have found him to be reliable and professional. Bikes are picked up and delivered on time, his driving responsible. All our clients were complementary about the way they (and the bikes) have been dealt with. 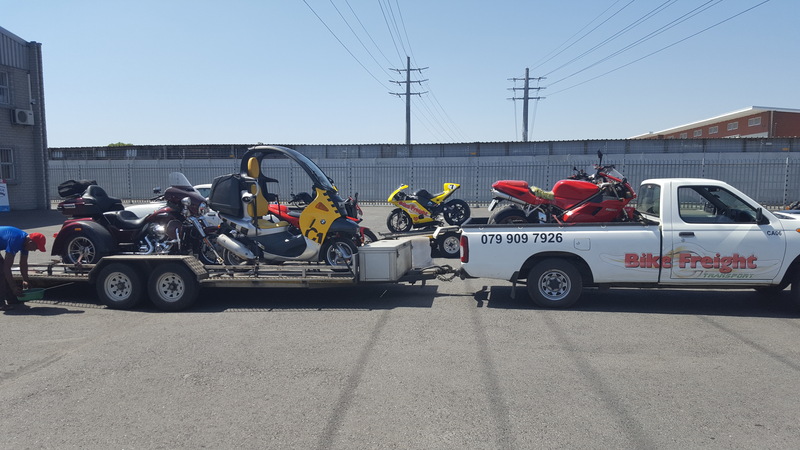 if you need further information, please contact me directly on 084 606 4449.
if you ever get requests for rentals/ tours in the cape town area, we can help with BMW & Harley-Davidson models as well as the necessary equipment.